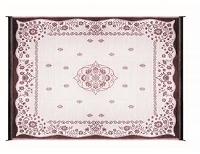 RV Awning rugs by Carefree and RV Patio Rugs by Carefree. With these options you are guaranteed to find what you need to keep your camping area clean and dry. 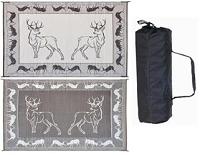 With a LARGE selection of Wrap Around step rugs by Outrigger and Camco RV you will be able to protect the interior of your RV dry and clean, these rugs are designed to filter water and dirt so that your step is not only slip free but clean. With a variety of sizes and colors to meet you every RV need, making your next camping trip stylish and more enjoyable. 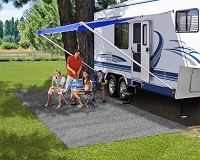 RV Patio Rugs help keep your camping area clean and looking good.With an extreme selection of RV patio rugs by Camco RV and our huge selection of RV awning rugs by Carefree. Don't forget to check out our selection of RV wrap around Rv step rugs by Outrigger and Camco RV , letting the dirt and water filter through while keeping your step slip free and clean. 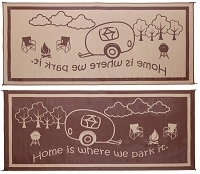 We offer a variety of styles and sizes that fit your every camping need. 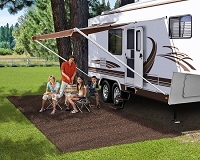 Rv patio rugs offer a defined look to your camping area while helping to keep the area clean and dust free. These Rv patio rugs are easy to clean and store. 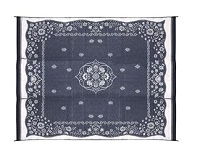 Now you can fix your RV step area with our selection of RV step rugs and accessories. Our selection includes step rugs, stakes, anchors, and wraparounds for your convenience. 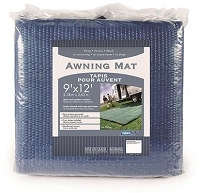 Patio mats will go below your awning in order to give you cleaner place to sit and relax while camping and also a place to wipe your feet before entering your camper.